WASHINGTON (AFP) - Myanmar's Nobel Prize-winning opposition leader Aung San Suu Kyi will travel to the United States (US) in September on her first visit since spending years under house arrest, a think-tank said on Tuesday. Ms Suu Kyi, who was elected to parliament this year in a dramatic sign of Myanmar's reforms, has indicated that she will attend a dinner in New York on Sept 21 to accept an award from the Atlantic Council, said Ms Taleen Ananian, a spokeswoman for the think-tank. It would be the 67-year-old Suu Kyi's first visit to the United States since the 1980s. She spent most of the past two decades under house arrest after a military junta refused to accept her party's victory in 1990 elections. 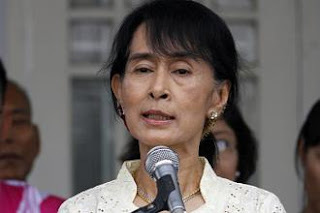 Ms Suu Kyi did not travel abroad again until May this year when she visited Thailand. In June, she made an extensive tour of Europe, where she was feted in major capitals and admitted that she felt exhausted. OSLO (AFP) - Myanmar's Aung San Suu Kyi on Saturday pledged to keep up her struggle for democracy as she finally delivered her Nobel Peace Prize speech, 21 years after winning the award while under house arrest. Myanmar's Suu Kyi feels ill at campaign ..